My Chev Ute – June 2006 – – Southern Tablelands Heritage Automotive Restorers Club Inc. In 1995 I spotted this vehicle, sitting forlornly in a shed at a friend’s place (Barry Boyce). I had finished restoring my truck and there was no projects going. After many weeks of sleepless nights of ‘will I? or won’t I purchase this vehicle?’ I took the plunge……..A good deal was struck. After a few weeks of ownership when I was about to start the project, along came an offer of a Holden which I couldn’t resist. The poor Chev went back into storage. 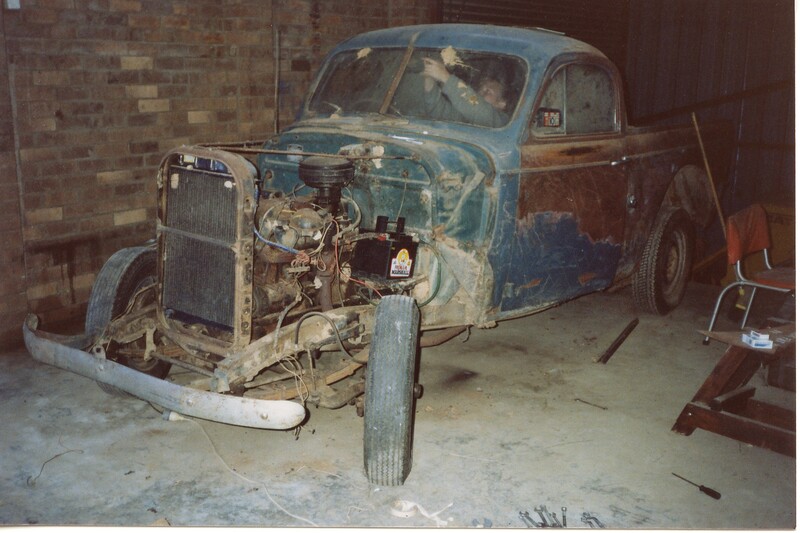 The Holden was finished in about 12 months, so back to the Chev! Wrong again – I was next offered a Chamberlain tractor (the ultimate in real tractors), so I bought it and it became my number one priority to restore. Perhaps the Chev might be next! I had in the mean time lost a bit of interest in the Chev as the Holden had become ‘the pride of the fleet’. 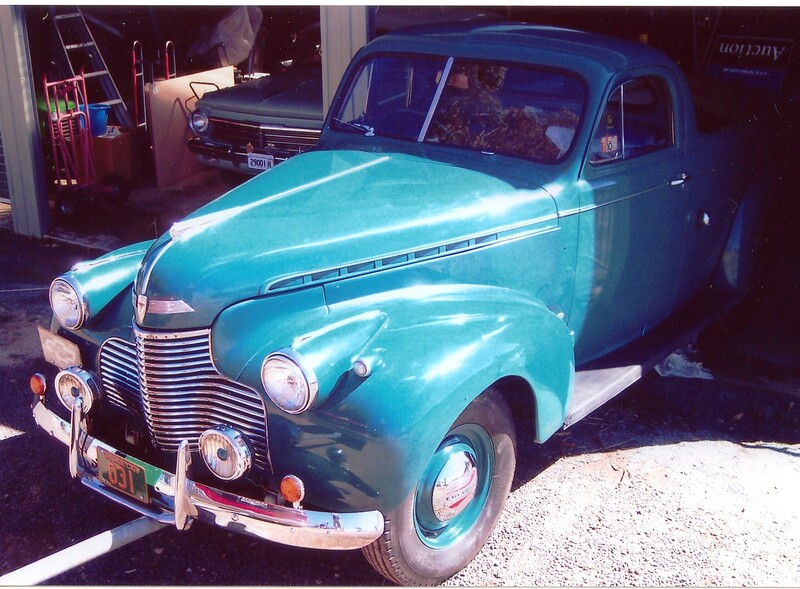 The Chev had no meaning to me, personally, until my ‘young’, 70 year old uncle came to stay with us. 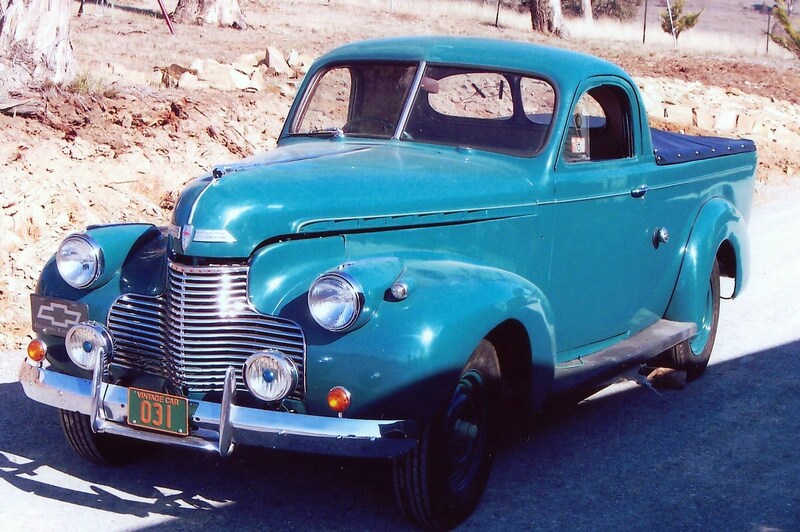 When he spotted the Chev, he showed a lot of interest in it and he told me that my grandfather had had exactly the same model Ute, on the farm near Wooragee (near Beechworth). That was the turning point. My uncle told me that it was my grandfather’s pride and joy and exactly the same colour as his. After moving house and joining the STHARC car club, the panel beating improved as a certain Mr. Cornwell came to my assistance. This poor guy was sorry he offered his help as nine months later he had fixed all my amateur attempts at panel beating and he had spray painted and polished it. Before he left after each working session he used to say ‘Don’t *!*#! *!*#! touch anything!!!! or you will stuff it all up again!! !’ I must say they were memorable working sessions with lots of laughter and cussing. I have just finished all the electrical wiring, fitting windscreens, windows and chrome work. The seating was upholstered as a birthday and Christmas present from my wife with the help of the Cornwells, who snuck out while I was away & took it to the upholsterer. Our son gave me some money for my Christmas & birthday too which I put towards the last work I have done, on the interior lining & upholstery. My thanks goes to Barry Boyce for helping me move the car. I am also impressed with the work of the young upholsterer, Phil Rainbird, from Capital Automotive Upholstery in Hume. I would certainly recommend him to others. The tray area has yet to be fitted out. The last 10% will be firing it up & taking it over the pits for rego. I will then be able to take another quality G.M. product on future rallies. 1940 Chevrolet Utility. Manufactured by General Motors Holden in Australia. Very scarce because of the small number produced during World War 2. Weight: 1 ton 800 hundred weight.